The Dill being boiled and drank, is good to ease swellings and pains; it also stays the belly and stomach from casting. The decoction thereof helps women that are troubled with the pains and windiness of the mother, if they sit therein. It stays the hiccough, being boiled in wine, and but smelled unto being tied in a cloth. The seed is of more use than the leaves, and more effectual to digest raw and vicious humours, and is used in medicines that expel wind, and the pains proceeding therefrom. A member of the family Apiacieae, dill is a close cousin of fennel, caraway, carrots, parsley, and anise. All of these plants produce feathery foliage, tall umbels of flowers, and distinctive, aromatic seeds. Despite dill’s delicate appearance, it’s actually quite hardy. Dill plants are generally tall, growing 4-5’, but both dwarf and mammoth varieties exist. In the case of dill, both the foliage and dried seeds are used as herbs to flavour a wide variety of foods. Dill complements fish dishes particularly well, and is commonly served with smoked salmon. And, of course, dill is used to flavour dill pickles — the flowers are sometimes used for this purpose. This is a very common culinary herb in the cuisines of Scandinavia, Germany, and Russia. Difficulty: Easy. Dill works fairly well in deep containers, but will be more robust in the ground. Timing: Start indoors in the latter half of April for transplanting in early June, or direct sow no earlier than the end of May. Sow repeatedly for a steady supply. If starting indoors, use peat pots — transplant shock can cause dill to bolt. Sow some more seeds in the fall for an early spring crop the following year. Sowing: Lightly cover seeds after pressing them into the soil. Soil: Plant dill in full sun or very bright shade, in relatively fertile, slightly acidic soil with good drainage. Aim for a pH of 5.5 to 6.8. Growing: Space or thin plants to 30cm (12”) apart, and keep watered. Tall plants may benefit from staking in breezy gardens. Don’t kill the caterpillars that appear on dill plants — they are the larvae of swallowtail butterflies. Harvest: Snip foliage as needed with scissors. Freeze in ice cube trays as you would basil, as dill doesn’t keep its flavour well when dried. The dried seeds keep very well, but seal them in a glass or plastic container, and keep them out of the light. Dill seed should be ground fresh when called for in recipes — the ground seeds also lose their flavour quickly. Harvest individual seed heads as they mature, but cut them from the plant while the stem is still somewhat green. Fully dried seed heads are brittle and easily shatter. Storage: Fresh dill is usually available year round. Look for bright, fresh-looking bunches that show no signs of wilting. These will store in the refrigerator for several days. Seed info: Properly stored dill seed remains viable for up to 5 years. Seeds germinate in 7-10 days in ideal conditions, between 10-24 °C (50-75°F). 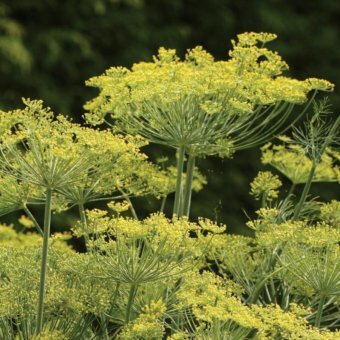 Growing for seed: Dill does not cross-pollinate with any other herb or vegetable, but insects will cross different varieties, so grow one variety at a time if you intend to grow the seeds on. Pests & Disease: Relatively trouble free. 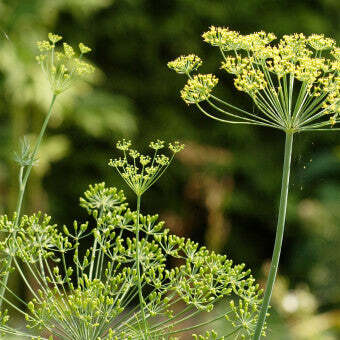 All dill varieties attract hoverflies, ladybird beetles, and parasitoid wasps, which all prey on garden pests. It is considered a good companion plant for cabbage, corn, cucumber, lettuce, and onions. Read more about Companion Planting with Umbelifers.